A chronologically arranged look at rock’s first 20 years that includes comment on the period’s political and cultural events, this book fails on several counts. First and foremost, the author gives us the whos, whats, whens, and wheres without examining overall trends or attempting to tell us what it all means. Moreover, he makes little effort to integrate his political and social material. 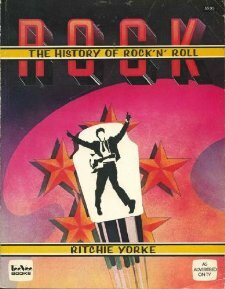 True, he follows a passage on Nixon’s Cambodia invasion by mentioning that the Temptations appropriately called the world a “ball of confusion.” But when it comes to relationships between politics and music, that’s about as far as he goes; elsewhere, Yorke simply offers rock stars and hits in one paragraph, elections and wars in the next. If these problems didn’t sink the book, its abundance of factual errors certainly would. Yorke misspells such names as Billy Swan and Lynyrd Skynyrd, for example, and calls John Lennon’s “Imagine” “non-political.” He also incorrectly reports the 1960 election vote; wrongly implies that Nashville Skyline constituted Dylan’s first post-accident album; and tells us about the same Elton John recording under entries for two different years. The book isn’t a total bomb. It does contain some interesting data as well as many full-color photos. But if you’ve got the $5.95 for this potboiler, you’re only four dollars away from a copy of the infinitely better Rolling Stone Illustrated History of Rock & Roll. Save your money and save your time.